Owner: Pacific Baseball Ventures, LLC. Assistant Coaches: Raul Camacho, Kyle Wilkerson, Justin Speer. Address: Corner of Rees Avenue and HWY 12. Dimensions: LF- 325', CF- 412', RF- 328', LF GAP- 359', RF GAP- 372'. to the action in the WCL. Highly touted prospect and 2015 first-round draft pick of the Toronto Blue Jays Johathan Harris started his pro career back in the Pacific Northwest with the Vancouver Canadians of the Northwest League. 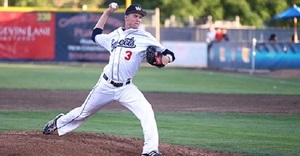 The first Northwest baseball experience for Harris was with the Walla Walla Sweets in 2013 where he made 8 starts. The Missouri native began the 2017 season with the New Hampshire Fisher Cats (AA). Pepperdine southpaw Easton Lucas got his first taste of college baseball with the Walla Walla Sweets in the summer of 2015. Lucas, who was rated as one of the league’s top prospects in 2015, returned and was even more dominant in his second campaign than during his first. 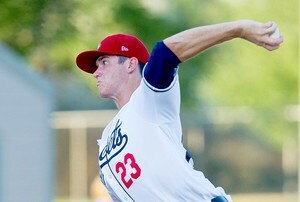 Starting with an Opening Day win against the Victoria Harbourcats, Lucas would go on to tally seven wins (finishing 7-2) in 2016, which placed him second to only Yakima Valley’s Zach Draper among league leaders in that category. He struck out 55 to only 12 walks, finishing in the top five of strikeouts on a team that set a new WCL record for strikeouts by a pitching staff (471). He was the second part of the All-Walla Walla Sweets battery for the All-Star Game, as he was the starter for the North on the mound. Borleske Stadium has a long history of being the premier sports facility in Walla Walla County. Named for legendary Whitman College athlete and coach Raymond Vincent Borleske (class of 1910), it has served as the home for a variety of professional and amateur teams in both football and baseball. The Walla Walla Sweets have called Borleske Stadium home since their inaugural season in the summer of 2010 playing their first game at Borleske on Wednesday, June 8, 2010. 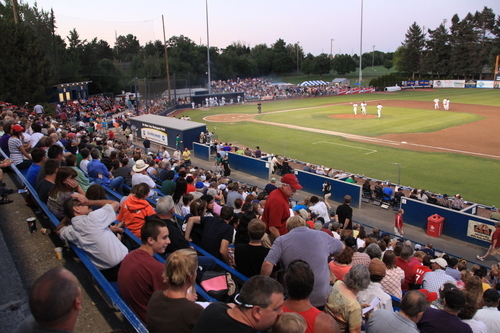 Borleske Stadium is often referred to as a pitcher’s park because of its expansive outfield and the giant Borleske blue scoreboard which stands tall in left field. Dimensions at the park are 315’ down the left field line, 410’ to dead center, and 333’ down the right field line. Borleske Stadium also serves as the home of Whitman College baseball (spring) and Walla Walla High School football (fall). One interesting element to Borleske Stadium is that immediately following the Sweets summer season the field is converted to a football field with the removal of the mound and the laying of sod over the infield.